Welfare benefits and the loss of leisure time still act as disincentives to earning a salary despite improvements in the welfare-work tradeoff since federal reforms in 1996, according to a report published Monday. The report by the Cato Institute found that the equivalent wage value of welfare has increased in 33 states since 1995, when the think tank first released a report on the issue. Benefits in the District of Columbia expanded by $6,850 to a total package equivalent to $50,820 in wages, the second largest increase behind Vermont. Welfare "pays" more than $15 per hour in 13 states. However, the report also notes that welfare recipients in 39 states can accept a job paying slightly less than welfare without losing income. That is a result of state and federal tax credits, such as the Earned Income Tax Credit and the Child Tax Credit, which are designed to encourage working and childbearing. Still, those tax incentives for work are often outweighed by the remaining tax burden and the loss of leisure, said Michael Tanner, a senior fellow at the Cato Institute and coauthor of the report, in an interview. "The benefit package is so large and the tax burden so high that it doesn’t make that much of a difference," Tanner told the Free Beacon. "A lot of people would choose not to work because of leisure. There’s a lot of sacrifice involved in going to work." Leisure in this sense acts as a good that welfare recipients will "purchase" more of by reducing their work effort, according to the Congressional Research Service. Individuals who have depended on welfare for extended periods are also less likely to find work offering higher incomes, the report states. Tanner recommended capping the amount of benefits an individual can obtain at the state level and strengthening federal work requirements to spur more entrants into the workforce. 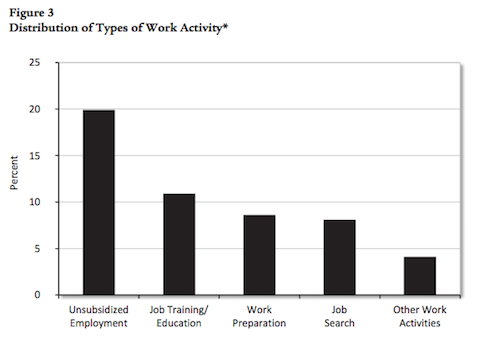 Less than 42 percent of welfare recipients engage in some type of work activity, which can include job training, "work preparation," job searching, or other work activities. The report suggests that President Barack Obama’s administration might have further loosened those requirements by issuing an executive order last year. The order grants states that increase the number of residents who leave welfare for work by 20 percent "more flexibility in defining welfare-to-work activities." Tanner said the report, which uses a single mother with two children as a case study, does not "pretend to match everyone." Yet it indicates that significant room for improvement still exists in America’s welfare programs, he added. "Many welfare recipients, even those receiving the highest level of benefits, are doing everything they can to find employment and leave the welfare system," the report states. "Still, it is undeniable that for many recipients—especially long-term dependents—welfare pays more than the type of entry-level job that a typical welfare recipient can expect to find. As long as this is true, many recipients are likely to choose welfare over work." This entry was posted in Politics and tagged Obama Administration, Welfare. Bookmark the permalink.